1. Security: Security is the main reason people choose to install automated gate systems to their home or commercial property. Not only are thieves much less likely to target a property with an automated gate, but the gate itself will make access to the property incredibly difficult. Due to the irreversibly geared motors, it would be near impossible to force the gate open. 2. Added Convenience :An automated gate allows you to gain access to the property quickly and securely. There are various access control types which can be selected to fit your needs, so whether you opt for key switches, wireless keypads,Bluetooth Mobile App , GSM Operator,Wifi options etc. 3. Increased Property Value :An automated gate will instantly increase your property value, and so makes a great investment piece. It can also help with insurance costs, due to the increased security it provides. 4. Keep Track of Those Entering and Exiting the Property : If you are a commercial property owner, then an automated gate system can make it much easier to keep track of anyone who comes on site. ID cards can be used to allow access to the property, while also helping to identify those who come and go. The automated properties will make the process much quicker and more efficient, reducing congestion at key exit points. It can also help you keep track of shipments arriving or being sent out, adding further convenience to the business. 5. Safety for Your Children and Pets : For homeowners, one of the biggest attractions of installing a gate is the security it offers their family. This is especially true for its most vulnerable members – children and pets. Not only will it help to keep intruders out, but it will also help prevent your children and pets from straying off the property. 6. Improved Curb Appeal : Well-designed automated gate systems can make a great impact and dramatically improve the curb appeal of any home. It makes a real statement to your home by adding a grand entrance to the property. With so many different styles and colour choices, you can be sure to find one that will match your home perfectly. 7. Keep away from Crime and unauthorized access : Automated gate systems will serve as a barrier to keep criminals and unwanted visitors away from your property by being your first line of defense. 8. Avoid Inconvenience: Manually-operated gates that need to be physically locked and unlocked are very inconvenient and time consuming to use. An automated gate, on the other hand, can be easily opened and closed with just a click of a button on your key and without the need to alight from your vehicle. This is especially useful when it’s raining and you don’t want to get wet. 9. High insurance rates : Insurance is an unavoidable expense that all property owners must have. It can be very costly though. However, some insurance providers may be willing to give you breaks for having automated gates installed because they provide additional security measures to your property. Certainly, automated gate systems solve many property-related problems and provide many benefits for you and your property, whether they are residential or commercial establishments. We Gajanan Electricalsand Electronics offers various types of Automated Gates ,Shutters ,Doors and any type of entrance Automation .Call us on 9689354999 or you may whatsapp or can SMS .Same way you could contact other sources to contact Gajanan Electricals and Electronic. 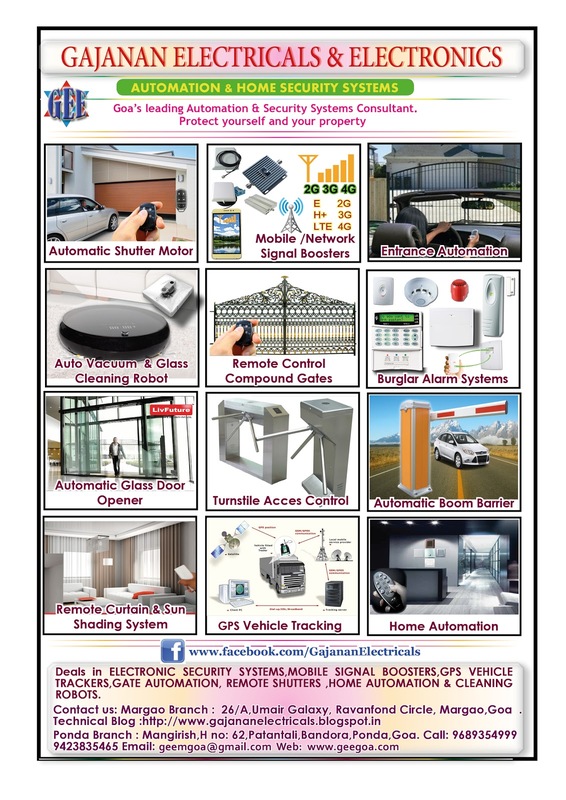 Call us for any requirements in MOBILE SIGNAL BOOSTERS ,GPS VEHICLE TRACKERS,AUTOMATIC COMPOUNDGATES,AUTO ROLLING SHUTTERS,AUTO GLASS DOOR ENTRY,TURNSTILE ,BOOM BARRIERS,HOMEAUTOMATION & VACUUM CLEANER ROBOT, STEAM BATH GENERATOR. SMS Marketing - Promoting Your Brand Was Never So Easy!